Cause we are living in a Bacterial World! 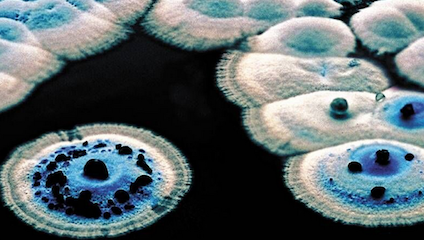 Culture Calling: What was the inspiration behind creating the exhibition Bacterial World? Paul Smith: It actually came out of another exhibition we did a couple of years ago called Bio-Sense, which was to do with how animals sense their environment. One of the strands in that exhibition was about how bacteria know where they are in time and space, and how they have a memory. We got talking to some of the microbiologists at Oxford University, and they were very enthusiastic about the concept of doing an exhibition. Out of that discussion came the idea that we should just dedicate an entire exhibition to the aspects of bacteria that people don’t know. If we think about bacteria, it’s normally in the supermarket, when we see all these anti-bacterial products, which creates a negative impression. So we thought it might be an interesting angle to rehabilitate bacteria, and to point out their good and essential nature in underpinning all life on earth. Luke Jerram, Glass E. coli (detail). (c) Courtesy of Luke Jerram. CC: Can you describe a bit more about the sections in the exhibition or themes that it will follow. Does it look at how bacterial is helpful on a global and then more personal scale? PS: That’s exactly how we’ve laid the exhibition out. We start on a planetary scale, with an image of Earth from space, and almost everything you see in that very familiar image, is underpinned by bacteria. The oxygen in the atmosphere and the oceans, the greenness of vegetation and the land, all of those aspects are reliant on bacteria, and have been for two and a half billion years! Then we zoom in, and look at the role of bacteria within whole ecosystems. Then we go down even further, to how organisms interact with bacteria. A lot of animals including us are reliant on a relationship with it that has evolved over time in order to function. Then finally we look at how bacteria interact with each other, how they compete, and how they co-operate. CC: And there’s a Top 10 Bacteria that changed the world section! PS: That was a tough one to pick actually – there were so many contenders! PS: It’s part of a series of exhibitions that we’ve been doing for about 4 years now, and the approach is to make them as accessible as possible. For some people that’s through the medium of art; we’ve got some beautiful sculptures by the artist Luke Jerram, including a huge blow up E. coli! We’ve also got interactive games, so there’s a whole range of things to make sure that people of any age or inclination can get something out of the exhibition. E. coli, Luke Jerram, installed in Sheffield. (c) Courtesy of Luke Jerram. CC: One of the interactive games is called Gut Wars which sounds quite amusing! PS: It was just too good an opportunity to miss really! One of the things we know is that bacteria actually fight each other. So just like a cheetah would chase after an antelope on the African Savannah, bacteria will also take out other species, in some quite creative ways. They can do it chemically, but also by harpooning other bacteria. So we thought a fun way of looking at how they fight each other would to be to create this game. And I’m really quite looking forward to seeing how it works. We’ve got another interactive called Bacteria Explorer. Bacteria are very small, so we want to be able to zoom into the world they inhabit, look at their shapes and as biological organisms rather than something that has to be cleaned up. CC: That links quite well with your interdisciplinary/artistic approach too, because I’m sure you see some quite interesting patterns and aesthetics when you zoom right in like that. PS: They can be aesthetically very beautiful. We’ve been working with an artist called Elin Thomas, who has, over the years, crocheted images of petri-dishes, which are the dishes of jelly we culture micro-organisms – such as bacteria – on. We invited members of staff from across the museum to bring in an object that meant something to them, and we embedded them into the agar jelly. Any bacteria that was on the object was transferred into the jelly, and grew into a bacterial colony. Elin is going to crochet them and they will be part of the arts component of the exhibition. Some people chose their mobile phone or something in their pocket like a coin, other people were a bit more sentimental and embedded their engagement rings etc. There was a real range and they have produced some really beautiful bacterial colonies. CC: What do you think are the highlights/stand out things to see in the exhibition? PS: I’m a geologist, so I’m interested in the origin of life on earth and the role of bacteria in shaping the planet in those first few billion years. But I love working at the arts science interface, so I cannot wait to see the Luke Jerram sculptures! CC: Who are the other collaborators who you’re working with as well as Jerram and Thomas? PS: The lead collaborator is a very eminent bacteriologist called Judith Armitage. She feels that bacteria are overlooked, has spent her entire career working on them, and wants people to get as excited about them as she is. She’s very well connected across the University, so we’ve called in people from all kinds of different departments, including from Microbiology and Biochemistry, Geography, (who have researched the public perception of bacteria), Earth Sciences and Plant Sciences. So there are all sorts of different aspects that we’ve taken and woven together into the narrative of the exhibition. CC: And just a cheeky last one… is the title an intended Madonna reference? Bacterial World runs from 19 October 2018 – 28 May 2019 at Oxford University Museum of Natural History, Parks Road, Oxford OX1 3PW.